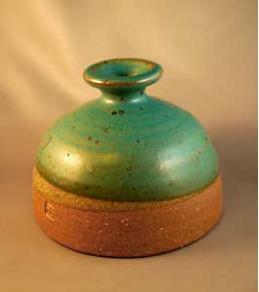 OTTO HEINO - CLOSED VESSEL - Rattle - Glossy Celedon with red spot on top - 2" tall x 3 3/4" wide - 2008 - #017. 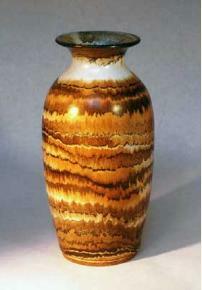 This vase was made by the noted California potter, Robert Maxwell. It is decorated with his classic primitive starburst. The edge of the lip is rough but it appears that this was intentional. There is a tiny chip on the lip. The chip is not visible while displayed because it is toward the back. The orignal roughness of the lip makes it more difficult to see the chip. The glaze appears more glossy in the photos than it actually is. Beautifully crafted vase attributed to the noted artist Nancy Wickham Boyd from Woodstock, Vermont. This vase is in beautiful condition with no apparent flaws or damage. The base has two smooth grey areas that either were caused by wear or where ground down at time of production. 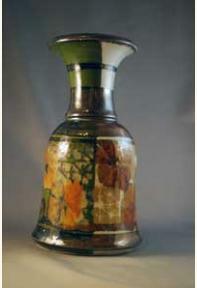 This lovely vase with a glossy glaze in earthy colors was made in 1980 by Bill Nagengast of Apple Lane Pottery in New Hudson, Michigan. 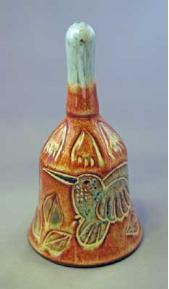 My favorite feature of this vase is its varied appearance and colors when viewed from different sides giving the decorator more choices for placement. In beautiful condition with no known damage. 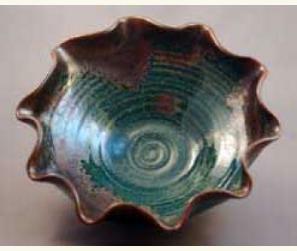 This bowl was handthrown by Ellis Ownby of the famous Pigeon Forge Pottery in Pigeon Forge, Tennessee. The dripping brown glaze has golden hints along its edges making a beautiful contrast to the glossy green. See detail page for inscribed signature photo. No known damage. There is a bluish spot on the inside of the bowl which is probably not intentional but a glaze defect. Beautifully carved bowl by the very skilled potter, Timothy Weber in Nashville, Tenn.
John Fassbinder made this gorgeous jug with stripe accents of dark blue and two large flowers in light and dark blue, one on each side. 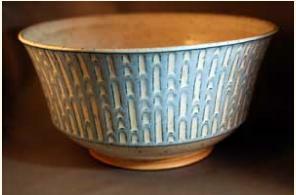 Fassbinder was a prominent potter in California and Washington State. 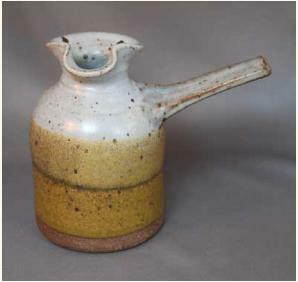 The jug is both signed "Fassbinder" and marked with 2 impressed chopmarks. There is unfortunately damage on the shoulder of the jug measuring approximately 3/16" round. Also there is a tiny bite (about 1/16) on the base which is not visible on display. See detail sheet for close-ups. This large heavy vase is covered in a lush glossy blue glaze with a collar of white frothing into shades of light blue. The maker of this vase is uknown but clearly was capable of throwing a nicely finished vase. There are two small chips to the base and some wear that is not normally visible. 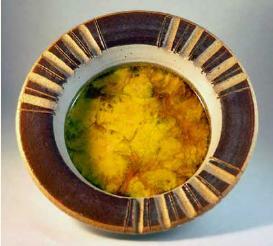 In addition there are two tiny glaze pops which occured during manufacturing. To view these small flaws see the detail page. A beautifully carved bud vase made by Sinclair Ashley of Tennessee. This appears to be a food cover but it is not clear if it was part of a set or has always been a solitary piece. 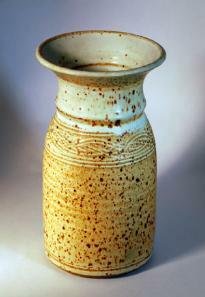 Primitive styled bud vase made by Di Bowler of the now closed Snake River Pottery. Roughly applied around the base is a rusty sandy texture. The bottom is inscribed with her name, Di, and the Snake River Pottery mark. Also inscribed is the date 1971. This vase was skillfully thrown and then decorated with Spangler's classic style using shades of warm brown in ripples extending up the vase to show a bit of white at the neck. Most likely made in the 1970's. A beautifully glass glazed dish aka ashtray. The bottom of this bowl has a thick crackled glass glaze with swirls of golden yellow and brown reflecting yellow, organge, red and gold. The interior edge and outside are glazed a semi-flat cream white. 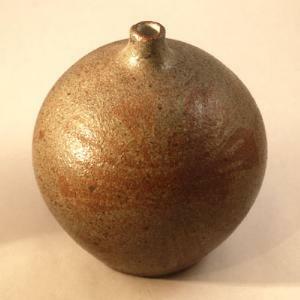 The top has a red brown glaze carved with a lined pattern. 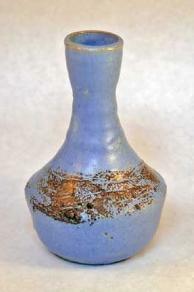 There are two cracks in the glass glaze that may have not been there when first made. They are in the glaze only and do not appear to compromise the bowl. Please see detail page for close shots of cracks. 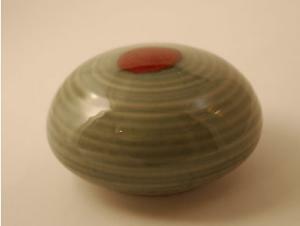 A very sensuous bud vase made by Isabel Parks. Parks worked with Warren Hullow in Pennsylvania. 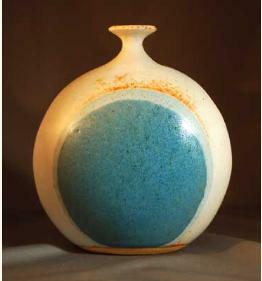 The vase has very tactile glaze with an abstract image of a blue moon on a white background and is in the shape of a flattened orb. This is a very modern styled vase. 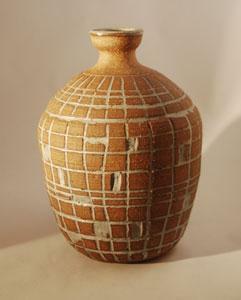 Functional art made by the master potter Byron Temple. This very pretty creamer has a semi flat glaze, grey white at the top with two shades of golden brown on the body. 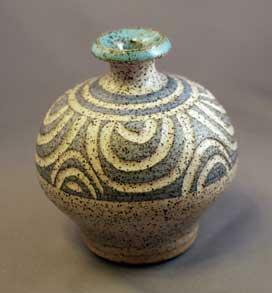 A very finely thrown porcelain jar made by master potterAndrew MacCorkindale in his Portland, OR, MacCorkindale Porcelain Studio. 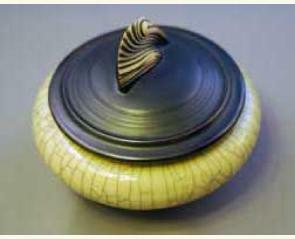 The lid is a flat gun metal black-brown and features MacCorkindale's classic ""shell" handle. The base is a high gloss cream colored crackle glaze. A very classic piece. COMING SOON: Ralph Spencer, David Shaner, Rita Yokoi, Blanch Cline, A.R. Cole, Paul Quyle, Solveig Cox, William Creitz, Kathy Bolin, Peg Tootelian, Glenn Burris, Sam Scott, Kaaren Stoner, Doug Hively, Patrick Horsley, Ulla Winblad Hjelmquist, Forrest German, Michelle Rigert, and many more. Also more: Victoria Littlejohn, Pigeon Forge, and Byron Temple.